Belgiovane Williams Mackay (BWM) is the Australian advertising agency responsible for the creation of Bigpond Holiday. Rob Belgiovane, executive director, worked with creative directors Adam Hunt and Mike Boswell, art director Kevin MacNamara, and copywriter Dean Hamilton. The 30 second ad was directed by Ben Lawrence and produced by Emma Lawrence at Australian film production company, Caravan Pictures with director of photography John Platt. 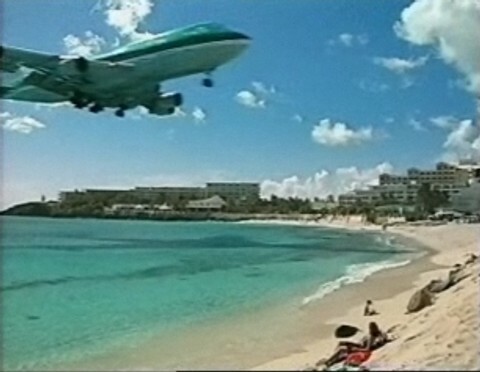 The ad was filmed in the island of Sint Maarten (Dutch)/St Martin (French) in the Carribean. There really are hotels right next to the airport – the ideal spot for aviation enthusiasts, as is shown on the SMX page of Scott and Cathy’s aviation site. You can visit Princess Juliana International Airport at its website. If you’re interested in a holiday in St Maarten, first check out the St Maarten Official Web Portal and www.StMaarten.org. Editing was done by Phillip Horn at Frame Set & Match, Northbridge, Australia. One of three Advertising Excellence/International awards at 2005 AICP Show, held by the USA based Association of Independent Commercial Producers (AICP). The ad subsequently became part of the permanent collection at the Museum of Modern Art in New York. A Bronze award at the Asia Pacific Adfest 2005.